So many things are just so much better when you make them yourself at home. Ice cream is no exception. Every single time I make a batch I am reminded of just how much better it is. The flavor is richer, the ice cream is creamier. And you can control the amount and size of add-ins. If there is one thing I hate it’s digging into big bowl of Cookies and Cream Ice Cream and finding just one or two chocolate cookies. I want a cookie in every bite. And I don’t want cookie crumbs either. I want big hunks of cookies. 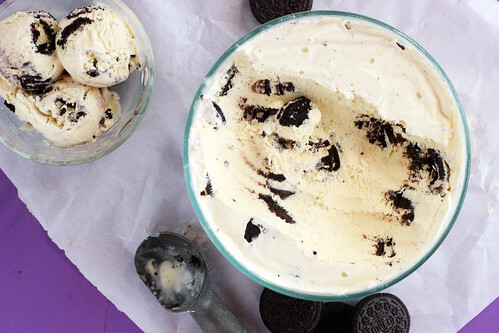 Making this ice cream at home means I get everything I want. In a sauce pan over medium-high, heat the milk and heavy cream. Once bubbles form along the edges remove from heat and set aside. In a heat proof mixing bowl, whisk together the egg yolks and sugar. Slowly add spoonfuls of the hot milk mixture to the egg yolks, whisking constantly so you don’t make scrambled eggs. Once all of the milk is incorporated transfer back to the sauce pan. Heat over medium heat for about 4 minutes, or until the mixture starts to thicken and coats the back of a wooden spoon. Carefully pour the mixture through a mesh sieve (in case there are any cooked egg chunks) into a glass bowl*. Stir in the vanilla and refrigerate for several hours or until completely cool. 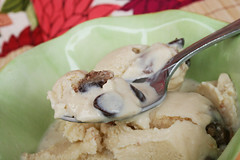 Once the mixture is completely cool, add to your ice cream maker and churn according to the manufacturers instructions. (I use the Kitchen Aid standing mixer attachment. I always store the bowl in my freezer but if you don’t, don’t forget to put it in the freezer at least 24 hours before making the ice cream). 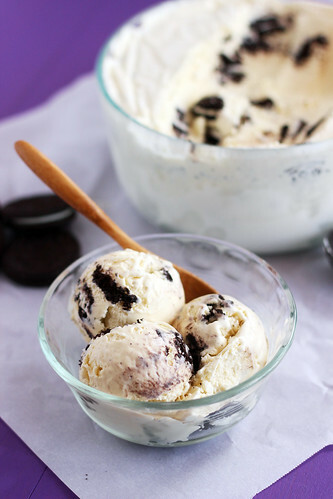 Once the ice cream is finished churning, fold in the chopped Oreos with a large spoon or spatula. 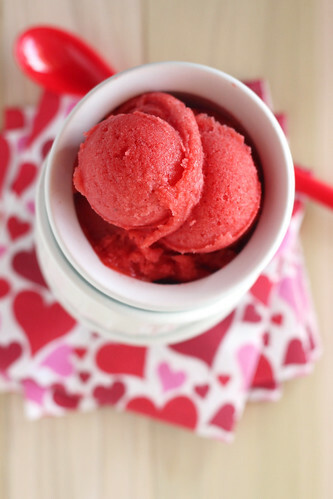 Transfer to a container with an airtight lid, press a sheet of plastic wrap right into the top of the ice cream and freeze for several hours. *To speed up the cooling down process I will sometimes place my glass bowl in an ice water bath and let it sit for about 10 minutes before refrigerating. 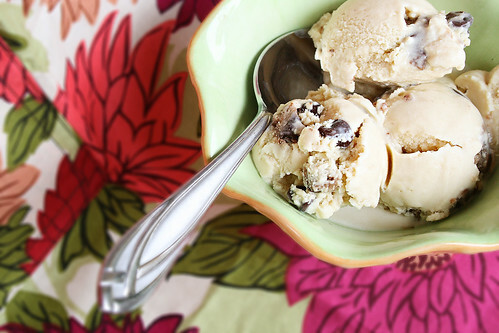 If you love cookie dough and kind of like cookie dough ice cream but usually find yourself just picking out all of the chunks of cookie dough and ending up with a bowl of melted ice cream (oh, that’s just me? 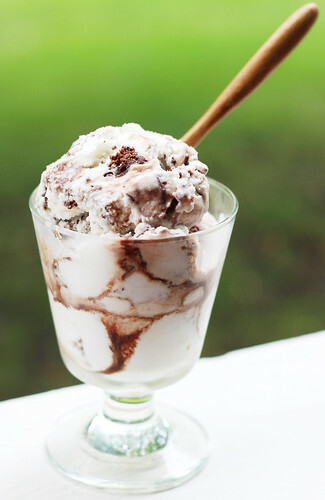 ), then this ice cream will knock your socks off. I knew pretty much the moment I saw this recipe that I would like it, but it some how managed to exceed my expectations. The double dose of brown sugar goodness is what I think really pushes it over the edge for me. I ate every last bite, not just the cookie dough, and I even had it for lunch, twice. I’ve been inspired and now I want to play around with this a little bit and see if I can come up with a peanut butter cookie dough ice cream. Now that is something that I KNOW Jesse would enjoy (hurry home honey so I can feed you delicious things!!). In a medium bowl, stir together the butter and sugar until smooth. Mix in the flour and vanilla then fold in the chocolate chips. Wrap the mixture in plastic wrap, form into a disk, and refrigerate until firm. In a medium saucepan over medium heat, melt the butter and brown sugar. Cook, stirring often, for 3 minutes, being careful not to burn it. Pour in the half and half whisking constantly until well blended with the sugar. Heat until simmering. While the cream mixture is coming to a simmer, whisk egg yolks until light and fluffy in a medium bowl. Then, using a soup laddle, add a small amount of the cream mixture to the eggs, whisking constantly. Whisk in the rest of the cream mixture one laddle full at a time. Once all of the cream has been added, return the mixture to the saucepan, and cook over medium heat, stirring often, until it has thickened slightly and can coat the back of a spoon (170-175 degrees). Remove from heat and pour through a fine-mesh sieve into a medium bowl, that is sitting in an *ice bath. Stir in the vanilla, salt, and milk. Let sit in the ice bath until the bowl is no longer warm to the touch, then cover with plastic wrap and chill until very cold. Freeze in an ice cream maker, according the manufacturers directions. 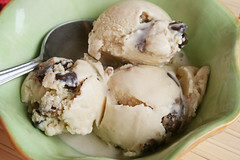 During the last minute of freezing add the chocolate chips to the ice cream. Then while transferring to a storage container add chunks of chilled cookie dough through out. 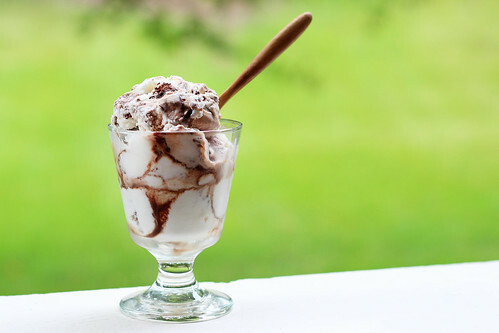 Always store homemade ice cream in an container with a well fitting lid (I like the Ziploc brand quart containters with screw top lids) and a sheet of plastic wrap pressed directly onto the top of the ice cream. 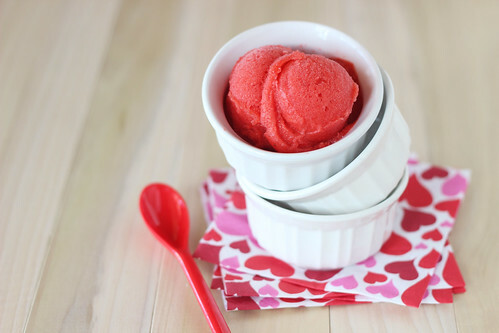 *Whenever I make ice cream I always fill my sink with 3 inches of cold water, 2 cups of ice and teaspoon of kosher salt. Then I place a large glass bowl in the water so when I am ready to pour the custard into the bowl it is cold and the ice bath is ready to go.